High street health beauty chain Boots the Chemist stock a selection of diet and slimming products – some are third party and some are Boots own brand. Triple Action Slim Aid is Boots own brand and has been available for quite some time, but does seem to have been overshadowed by the inclusion of the much publicized Alli and Appesat. 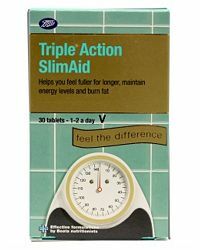 Triple Action Slim Aid suggests that you can manage your diet and maintain your desired weight by creating an easy regime where you take one tablet before any large meal. The diet pill is formulated to suppress appetite and make you feel fuller for longer, burn fat and provide an increase to your energy levels. Not so different to the dozens of US focused diet products that offer a multi-action effect! It is advised to avoid if you suffer from a thyroid disorder – other than that there does not appear to many potential health risks. Any scientific evidence appears to be conspicuous by its absence. Not a product to pin your weight loss hopes to. Not a premier Boots diet aid. 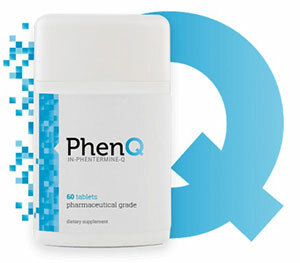 PhenQ is the UK’s best selling diet pill. It is quite possibly the diet pill with the most column inches devoted to it and most media exposure. When PhenQ was released it sold out completely after just 3 days selling 50,000 units. It sold a reported 1 million units in first 6 month. PhenQ can offer many benefits – it is a highly effective fat blocker and also a fat burner and appetite suppressant.